A Hydro Instruments chlorinator/sulfonator system feeding a pipe line using a turbine positive displacement pump. 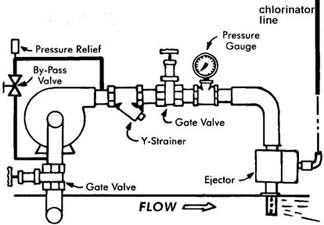 The pressure relief valve must discharge to a drain or outside of the building. Note the by-pass of the piping from the pump discharge through a by-pass valve back to the suction side of the pump. Note 1: The by-pass valve must never be completely closed. Note 2: The pump suction and the ejector must be installed into the side of the pipe line, not the top of the main.